Received the SkyNews magazine a week or so back. November/December 2015 issue. 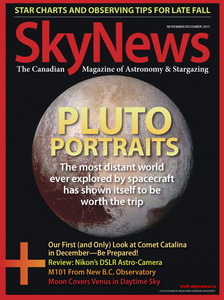 Article and images of Pluto. What an incredible mission. Hey! Neat! An article on the new astronomer-friendly Nikon DSLR by Malcolm Park. And a piece about the dark skies near Kingston. Close to Guy's heart.